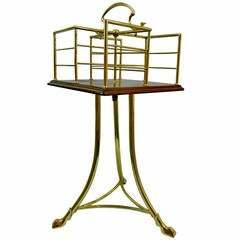 French polished brass and iron umbrella stand, 19th century. Polished brass coat hook French Art Nouveau, 19th century. 19th century English revolving mahogany and brass book stand or side table featuring a revolving top with a handle and four dividers supported by a tripod base. 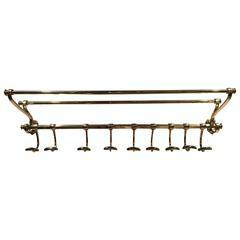 French solid brass coat rack and wall shelf, 19th century. 19th century English brass and cast iron umbrella stand. Wrought iron umbrella stand with brass knobs and feet, Germaby, nineteenth century. 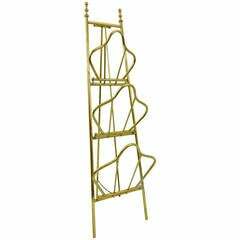 19th century English brass and iron umbrella stand, curved top. Highly decorative brass with a wooden shelf inside to accommodate shorter/average sized umbrellas.